As you drive across the Rickenbacker Causeway connecting you to Key Biscayne and take in the mirror-like reflection of the clear Miami sky off the still water… a sense of gratitude kicks in. The Miami Open tennis tournament played on Key Biscayne with storylines on and off the tennis court adds a sense of thanksgiving for who is actually in the tournament and will it still be played on Key Biscayne among this beautiful backdrop. Entering the tournament: Roger Federer who has won two of his first three tournaments in 2017, and current No.1 Angelique Kerber headline the 33-year-old tournament. Injuries sideline eight-time women’s champion Serena Williams and six-time men’s champ Novak Djokovic, meaning what you see is what you get and the field was wide open on both sides of the draw this year. Off the tennis court, constant speculation arose that the Miami Open, who is only one year older than my personal age, will leave Key Biscayne’s Crandon Park Tennis Center. Cash rules everything. The Miami Open has seven years, including this one remaining on its lease with Miami-Dade County. But its future has been in question since an appeals court decision in December 2015 prevented the tournament from a $50 million expansion upgrade because of restrictions related to the Matheson family’s 1940 donation of the property to the county. Player locker rooms can use some renovation to say the least. Miami itself loves the tournament as a record crowd of 14,766 saw the men’s final and it draws 300,000 tennis fans who enjoy sushi and champagne. Moreover, a cool 386 million in economic impact. Grateful. Grateful. Grateful. Tennis was played on the island but as mentioned earlier, Serena Williams, Djokovic and also Andy Murray were M.I.A. A knee injury for Serena and elbow issues for Murray and three-time reigning champion Djokovic. The beat went on. The finals. Ladies first. Serena’s knee injury eliminated the biggest star by far in the tourney. She’s an eight-time owner of the Miami Open trophy moreover a local fan favorite in the 3-0-5. Sister Venus Williams was eliminated in the semifinals by Johanna Konta. Konta, who still has her name “Googled” by some, defeated Caroline Wozniacki in straight sets. Neither woman was in the top 10 in the WTA rankings. The men’s side is where the fireworks were lit on the island. “Fedal” to the rescue. 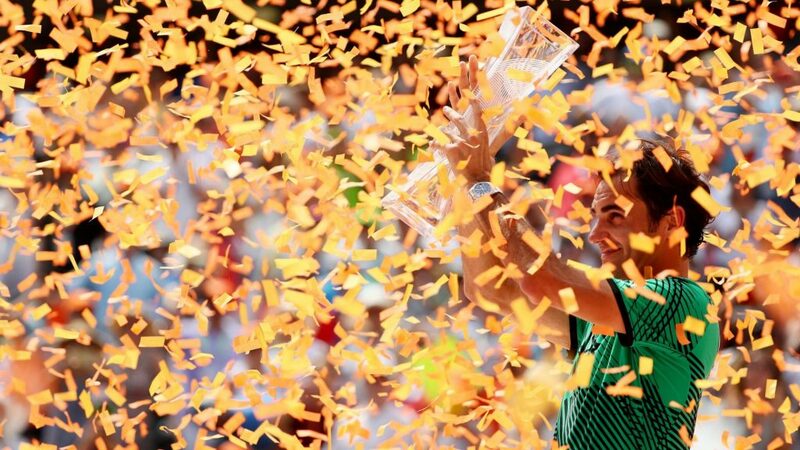 In the 37th all-time meeting between Rafael Nadal and Roger Federer, the trophy went to the hottest player in the men’s game for the time being with a 6-3, 6-4 Federer win. Lucky number 13. That’s the number of years since they played each other for the first time in 2004 at this same tournament. Federer just awed me at times. Yes, Murray and Djokovic were out however Nadal still remains cooking with gas. Age is just a number but at age 35, he still writes his own script becoming the oldest champion in the tournament’s history. It was his third title here and his first in 11 years; I can’t forget a check for $1.175 million. Nadal will leave the island empty handed for a fifth straight time. Federer is coming off a six-month layoff to deal with a knee injury. He is the hottest player on tour with a 19-1 record (7-0 vs top 10 players) and titles at the Australian Open, Indian Wells (California) and now Miami. “I kept trying to remind myself. Play without pressure. Just do it one more time. Be brave on the big points and I think I was able to do that,” Federer stated. It is Federer’s best start to a season since 2006, when he began 33-1. I will not break down the points and the sets played instead this was a couple of fine aged bottled wines ready to be corked. They say it is a young man’s game however Nadal and Federer, also known as “Fedal,” both played in the first over 30 men’s final in the tournament’s 33-year history. It was not a major but two historic rivals donning their Nike swooshes on their sleeves in a top tier tournament. Grateful. Nadal won the most recent of his 14 career majors in 2014, but gave no indication he is ready to get off the train ride just yet. Instead he has faith in his steady improvement as a player. “He (Federer) was playing good and with high confidence. When a top player like him plays with high confidence, it is tough to win,” Nadal stated. During the final, Nadal stopped play to look up at a small drone floating along the clear Miami sky. A moment of reflection per se, then resumed. I don’t know what is next for the Miami Open. Miami Dolphins owner Stephen Ross even offered to take on the tournament in a new facility he would build near Hard Rock Stadium. Cash rules everything. I know Federer will not play on any clay tournaments until the French Open. He shared he wants to rest the body, take a break with family and relax the mind. Gratitude.